When I first used pinterest to find images months ago, I did not expect that it will go mainstream. Unlike other social media platform that you post status/link/photo/video, pinterest is strictly for image only. I would imagine that only people in visual-related industries are interested in it. But seems it’s not true. There are currently 60 million-plus google blogsearch result for pinterest; the no. of visitors has increased tremendously over the last few months; it is 3-times more engaging than twitter (though still far behind facebook). 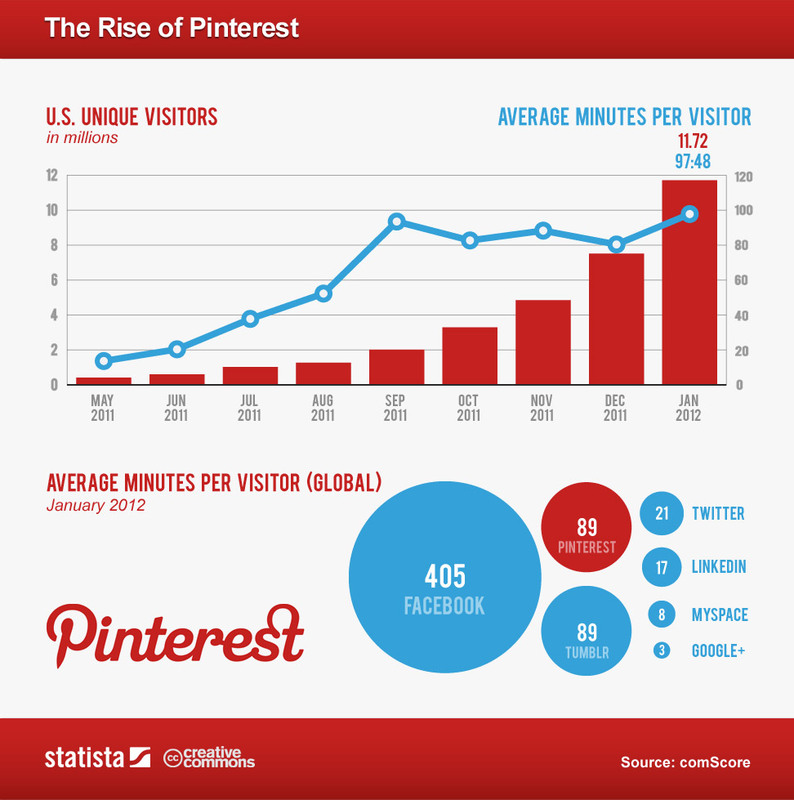 Judging from the fact that it’s a relatively new social platform, there is huge potential for pinterest. The infographics representation comes back for a reason. It attracts attention and makes information easier to understand. We get distracted so easily; according to the book The Shadows: What the Internet is doing to our Brains, webpages are viewed for 10 seconds or less. Research has shown that we tend to skim article in the web. Although we will spend more time on lengthier information, we just 4.4 seconds more for each 100 words. Most of us won’t read article packed with words thoroughly. This proves a need for infographics to make complicated information as easy to read as it can. Is the growth of visual-based communication means the death of words? It’s certainly debatable here. But let’s not forget that our ancestor used drawing to communicate before there’s something called words. The flourish of visual communication might be an urge to return to the primitive human instinct, and a reminder of our anthropological origin. I don’t think the words will ‘die’. We are getting more and more visual over the past few years, but for we still need an argumentation by or visual. We are using more and more visuals and the visuals are becomming more abstract. So that means we will not be able to understand everything, especially people who don’t come from the creative industries. Most pinners are housewomen, pinning stuff they like and household tips. Only a few of the pinners are using it as a documentation for visuals. So end of story, words will still mean a lot, maybe it will be 50/50 in the future, but for now words are alive! I don’t think words will die either. Maybe there has to be a equilibrium point, visual and words balance each other, as you said, 50/50.